Are you swamped with piles of outgrown baby and toddler clothing? It’s amazing just how quickly your little one can outgrow an entire wardrobe. Unless you’re planning on having another child anytime soon, it can be a great idea to upcycle these outgrown clothes. To give you a little inspiration, below you’ll discover some of the top creative ways to upcycle your baby and toddler clothing. Babies and toddlers LOVE teddy bears, so what better way to upcycle their old clothes than to create a bodysuit memory bear? You’ll need to use the bodysuit without legs and you can add a cute bow to the bear’s head if you’re creating it for a girl. You can check out how to create this adorable bear here. It may look like a lot of work, but it’s actually surprisingly easy! You’ll be creating something your child can treasure potentially for the rest of their lives, and you’ll feel a sense of pride at your clever re-use of those old baby clothes. Why not give your old baby clothes to those who need it most? There’s an awesome website known as Freecycle.org, where you can list your old clothing (and any other unwanted items you may have) for free. Once listed, anybody searching for baby clothing will be able to see what you have available and contact you. Typically, you’ll be giving the clothes to those living within the same area, so they’ll either be collected, or you can choose to deliver them. A fantastic way to repurpose baby and toddler clothing, is to create pillow or cushion covers. The great thing about this is, you can be as creative as you want to be. Simply purchase some plain cushion covers, then decorate them with any old clothing you want to use up. Cut out the characters or shapes featured on the clothes and bring them together to create a unique, themed cushion cover. Need a little inspiration? Here’s an awesome example of a pillow created with old baby clothes – The Scrap Buster Fall Pillow. Another great creative toy idea is to turn your old baby clothes into a ribbon block. Your little one is sure to have hours of fun with this awesome and adorable toy block. The great thing about this idea is you don’t need to stick to a theme. In fact, the more colorful the block, the better. All you’ll need is your outgrown baby and toddler clothing, some ribbon, something to stuff it with and a sewing kit. You could even use the stuffing out of a quilt to fill the middle of the block. The full instructions for this creative idea can be found here. If your little one has quite large dolls, you can use their old clothes to dress the doll. Your child will love to play dolly dress up with the clothes they used to wear. Of course, you’ll still be left with them once your child outgrows the doll, but it’s a great temporary solution. As your child grows, it’s easy to forget how small they used to be. What better way to remind yourself, than to create baby clothing pictures? You’ll just need big enough frames to put the clothes into, then they can be hung on the wall in a collage style, creating a unique, sentimental display. This idea actually comes from Martha Stewart herself. You can find full details here. One of my personal favorites on this list, you can use any outgrown clothing and turn it into an activity book. By attaching a small skirt, shirt and a zip-up top for example, you can teach your little one all kinds of clothing-related things. For example, you could use it to teach them how to button or zip up clothing. You could also use it to teach them more about the different types of clothing they wear. Discover how to create this awesome activity book here. If you absolutely can’t bear to part with the clothes just yet, you can save space by sealing them into vacuum bags. This enables you to store them securely and easily and keep them out of sight in the loft or under the bed. This is also a great idea if you’re unsure whether or not you’ll have another child in the not too distant future. Do you have any Christmas themed baby clothes? If so, creating a Christmas stocking with them is a fantastic idea. You don’t need Christmas themed clothing, but it definitely helps if you have it. If not, you could use plain baby clothing and decorate it yourself afterwards. This is something your child can use year upon year. They may even end up keeping and using it throughout their adult life too. Learn how to create this beautiful gift here. One of the most difficult ideas on this list, but definitely worthwhile, is a baby clothes bouquet. This makes an adorable decoration which you can use throughout the home. It would look especially stylish and unique in the nursery or bedrooms and you can create practically any design you want to. Details on how to create this unique decoration can be found here. Have You Tried Our Clothing? Starlight Baby’s premium clothing is built to last, meaning they’ll be with you as your baby – and even your family grows! If you haven’t already checked out what we have to offer, you can browse our selection by clicking here. Of course, you can always sell or give your old baby and toddler clothing away too. 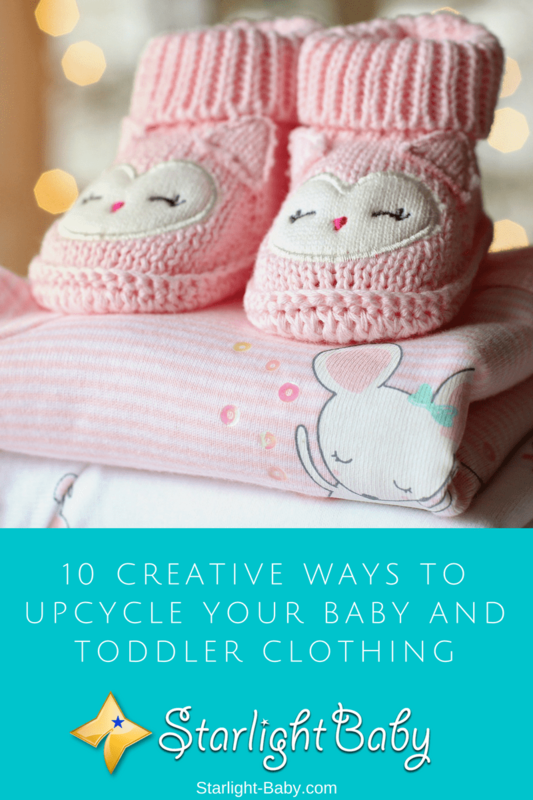 As you can see, there are so many ways you can upcycle your old baby and toddler clothes. Maybe you have another idea? We’d love you to share your ideas below! Wow, these tips are all wonderful to see a lot ways to put one’s toddlers cloths into some other good use. There are so many options to choose from which all looks cool but I also love the option of immortalize these clothes in pictures. Immortalizing the clothes in pictures is also a wonderful idea, Martinsx. Thank you for sharing your tip. The thing I love most about pictures is that as long as it’s not corrupted by virus or anything, it’s going to stay for ages without fading as long as it’s still in the soft copies. One way to ensure that such pictures does not get corrupted and lost forever is by either uploading them to one’s Google account or other social media sites, this way you achieve have access to the pictures from anywhere in the world. Storing photos and videos online, like in Google as you’ve mentioned, seems to be the best way to ensure we do not lose all of them for future viewing. Photos could eventually fade, or videos corrupted, or storage could be misplaced. So yes, I agree they would be safer online. What a great idea on how to put baby’s clothes that we are no longer using to other good use. The tip on using some of them as doll clothes are so on point, I’m definitely going to try out some of my baby’s clothes that she is no longer wearing to doll dress. I have never heard of Freecycle.org. I will check this out and see if I can donate my baby clothes to other people through this website. However, I have already started donating my baby’s outgrown clothes. Lending old clothes is a common tradition in my place. My baby wore his cousin’s clothes. Soon my brother will have a baby and his baby will also wear my baby’s outgrown clothes. I really liked the ideas to recycle baby clothes, I might use some of these. Giving away your baby’s old clothes to those who will need them is a fantastic idea. I did the same thing with my kids’ clothing because I have a younger sister who had three boys in a row, so all my grown-up boys’ clothing was passed on to them. This is really amazing for I always feel excited when I see babies that are clothed in a nice way. The good thing about using many of the tips listed is that you get to gel better with with the baby and your baby will as well always look smart and cute each time you step out for an event.